Distinctive jewellery for the urban aesthete inspired by antique cultures, futuristic landscapes and the timeless allure of preciosity. To create a complete brand identity and brand storytelling package for this London-based designer jewellery brand, including a new brand strapline, mission statement, ‘about us’ copy and collection descriptions. To provide social media and content marketing plans for the business in-keeping with its time and staff resources. To create a concise buyer persona to re-evaluate the brand’s target consumer. To develop a complete brand package linking a futuristic and architectural aesthetic with traditional values of craftsmanship, while also referencing the handmade nature of collections. To develop a concept for a new collection of ‘Rock rings’, including product descriptions for each individual design, a press release and co-ordinating content on the Cardinal blog. 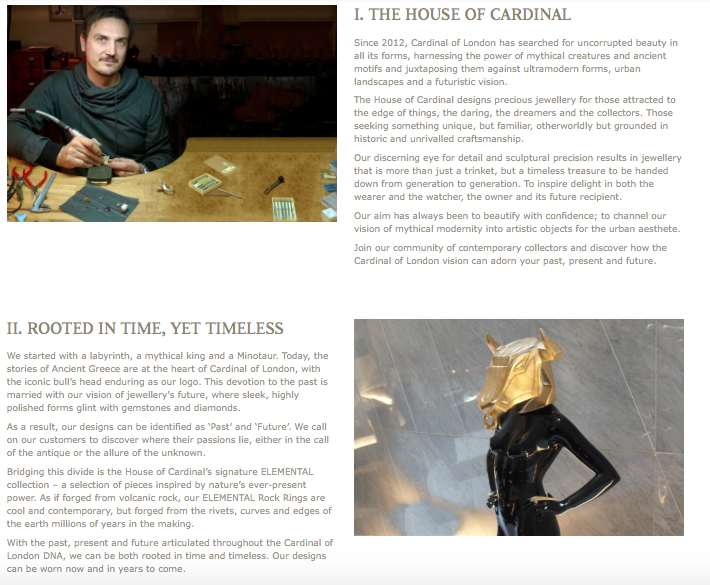 To provide accessible content marketing and social media marketing documents to allow the Cardinal of London team to move forward using their own resources and in-house staff. Other miscellaneous marketing support, including press releases. Digital guidance and customer journey mapping to improve the shopping experience on the Cardinal of London website. Cardinal of London proposed two main objectives. Firstly, it wanted to fuse both historic and futuristic inspirations into one cohesive brand identity. Secondly, it wanted to highlight that its collections are handmade by expert goldsmiths in London. To do this, The William Agency set about creating a completely new brand identity, incorporating a strapline, mission statement and a new ‘House of Cardinal’ story. This brand story – segmented into four distinct chapters – was also fed into a social media strategy for the brand. 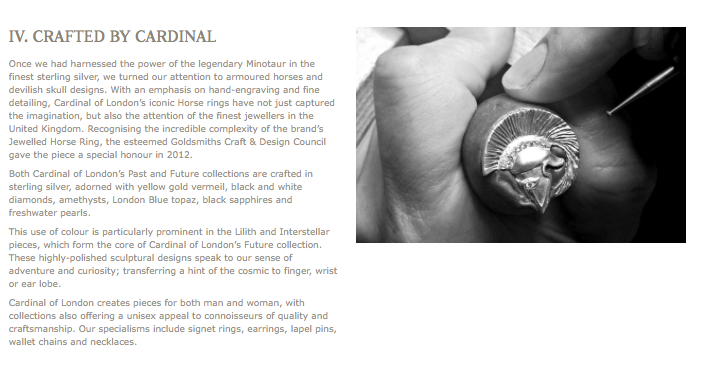 With this in place, The William Agency supported Cardinal of London with the launch of its Elemental collection, incorporating its successful range of Rock rings. This involved a distinct story, eloquently merged with the overall brand identity, alongside blog posts and press materials. Our branded content and storytelling techniques bring the values and ethos of your business to life. Let our copywriters harness the authentic story behind your company and transform it into copy that sets you apart from competitors. Find out more about our brand storytelling services and get in touch to find out how our specialist team can turn your most important values into an engaging and inspiring brand identity. Do you have a specific social media strategy? Our social media marketing talents increase reach, boost engagement and support brand identity in a crowded digital landscape. Whether you’re looking for a social media plan to guide you through all social platforms or a complete community management package, we can help. Find out more about our social media marketing services and speak to us about the benefits of a #wordclass social media strategy. Follow The William Agency on Instagram, Facebook, Twitter and LinkedIn to keep in touch and find out more about our expert content marketing services.